Fish Berkley Gulp bait using Texas and jig head rigs. Berkley Gulp baits are soft plastic imitations of natural food that fish like to eat. From earthworms and minnows to crayfish and grubs, Berkley produces a wide variety of fish attracting imitations for a wide range of game fish. Gulp baits are packaged in a "sauce" that is designed to disperse a scent trail in the water and also encourage a fish to hang on longer during a strike for greater hook setting potential. Fishing Berkley Gulp bait can be done using traditional rigging methods. Slide a bullet nose weight onto the end of your fishing line followed by a glass, metal or plastic bead. Attach the line to the eye of an offset round end or extra wide gap hook with a Palomar knot. 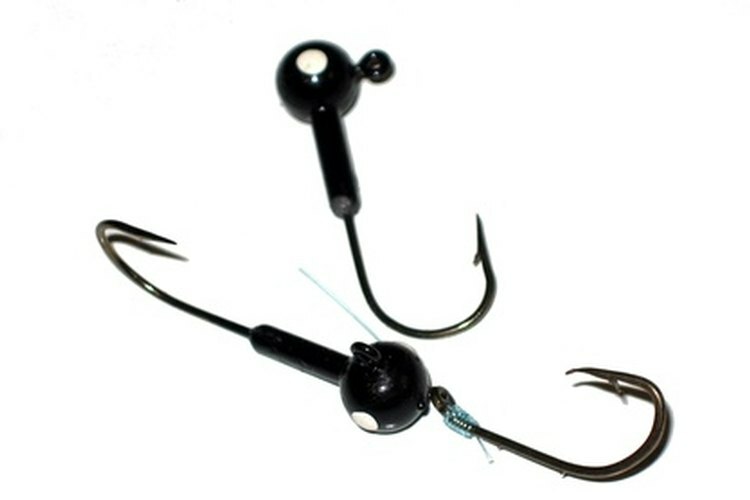 Feed 5 to 6 inches of line through the eye of the hook, turn the line and feed it back through the hook eye. You should now have a double line on one side of the hook and a loop on the other. Tie an overhand knot with the loop and double line, pull the loop around the bend of the hook, moisten and pull tight. Rig a Berkley Gulp Wacky Crawler, Turtle Back, Night Crawler or similar type soft plastic using a Texas rig. Insert the point of the hook into the nose of the Gulp bait and into the body for 1/2 inch. Turn the point of the hook down and out the bottom of the bait. Slide the soft plastic up and onto the offset of the hook so the nose rests just below the eye of the hook. Turn the hook point back toward the bait and slightly bend the Gulp bait. Insert the point of the hook into the body of the bait and out the top. Arrange the bait so that it lies straight on the hook from the offset to the point. Insert the point just under the surface of the soft Gulp bait. Rig a grub, minnow, leach or other short plastic Gulp bait using a jig head hook. Attach the jig head hook with a Palomar knot. Hold the hook in one hand and the Gulp bait in the other. Lay the hook alongside the bait with the base of the jig head even with the nose of the bait. Note where the hook bend exits the bait body. Insert the point of the jig head hook into the nose of the Gulp bait and guide the hook straight through the center of the bait. Aim the point of the hook for the point you noted earlier where the bend exited the bait body. Push the point of the hook out of the bait and arrange the Gulp plastic on the shank of the hook so it is straight.